If you’re a local art aficionado then you’re sure to have heard of the talented Lorraine Loots who paints beautiful and intricate miniature paintings. I.. The next photo is far from pretty, apart from my cat chilling on the bench, and yes, this is what our courtyard used to look..
Today’s post features a collection of unique paintings that were sourced in India and locally framed here in Cape Town. 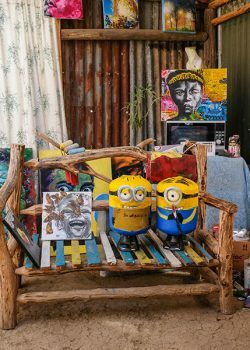 Each one is hand painted on old..
Greyton is really one of the most charming villages in the Western Cape, it’s less than a 2 hour drive from Cape Town so it’s..
Green is the colour of growth, the colour of spring, of nature and renewal. Adding green to your home helps to create a sanctuary away from..
I’ve been searching for simple wall hooks for hanging tea towels and finally found some contemporary ones from Handles Inc. While on the hunt I.. I spotted this home on Pinterest and was drawn to the beautiful, soft palette and clean, contemporary finishes. On reading further, I discovered that this.. Hanging chairs are once again having a moment and just about every dreamy boho home you spot on Instagram has a gorgeous hanging chair of.. If you’re a fan of interiors, architecture and design then Madrid is absolutely where you should be right now. Here are three reasons to visit.. Interested in what 2018 holds for us in terms of interiors? Today local design expert, Karen Steyn, is giving us the low down on the..